Week 3 started off well, with a boot camp session down at the the beach with the gym. It was a fundraiser for one of the members who would be participating in the 100th anniversary of ANZAC day by walking the Kokoda trail. For those not familiar with Australian History this track was pretty important in the World War II battle for our “diggers”, another name for the army. All the money raised on the day went towards the charity he was raising money for by doing the walk, and I think he managed to raise quite a large amount – woohoo! While the overall exercise amount for the week was good, unfortunately the same could not be said for the diet. I had a few days of goodness, but most days I was averaging around 1500 – 1600 calories, at least 300 over what I was aiming for. Not good. When I entered the 12 week challenge, I always knew my issue was going to be with food. Exercise is not a problem for me, I enjoy slogging it out. Work wise it was incredibly stressful this week, and I dealt with that by indulging in an afternoon snack of a cookie. Just one slip up daily, but it was costing me in the calories. I didn't hide from it though and accounted for it each day in MyFitnessPal (my calorie tracking app), and each day consciously made the decision to consume the biscuit. I just didn't know how else to deal with the stress, when I was so time poor I couldn't walk away from the office. Too much to do, no time to do it and no conceivable way of easing the stress. At the end of the week I was lucky enough to not have gained weight, but I certainly hadn't lost any either. 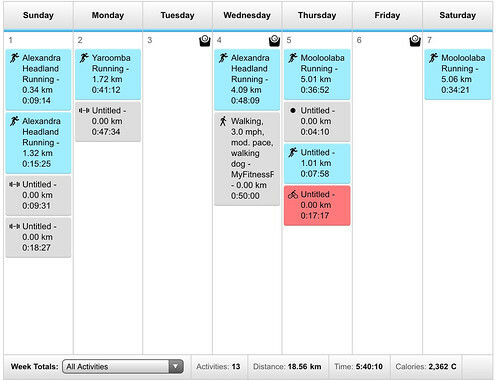 On a more positive sign, I ended the week with the 12 week challenge fun run. I entered the 5km event, with the aim for each participant to run as best as we could over the distance. In another 4 weeks we'll be re-running the same track and comparing our times as a way to gauge our improvement. On the Sunday I would be backing it up by running another 5km event (the Women's International Day Fun Run), so I didn't want to go out too hard. As it was, it was a tough track in that right in the middle we would be running up over the steep Mooloolaba/Alex hill, travel 3/4 of the way down the other side, then turn around before running back up and over to track back to the start line. I have never been able to run up that hill once without dying and needing to walk at the top, so to run up and over then back again seemed impossible. I'm stoked to say that I did it, and did the entire run in 34mins. I did end up getting a huge stitch at 3.5km mark and had to walk/run until the end, so taking that into account the 34mins is actually pretty decent! I'm looking forward to redoing it and seeing how much I've improved. As a summary, this week has demonstrated that my observations written in my pre-challenge post “12 Week Challenge: What is it and why am I doing it?” about food and stress were correct. This is by far my biggest challenge I need to overcome. However I'm proud of myself for not hiding away from what I'm eating, and that I'm still making myself accountable for my decisions by being completely honest in MyFitnessPal. That's step 1. If only there was an easy “off” switch for stress.